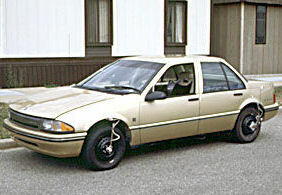 Up until this year the general public had really only seen one picture of the original Saturn prototype that was taken when it was unveiled to the automotive press in 1984. However this year, thanks to the General Motors' collaborative GMnext 100th anniversary website, a bunch of never-before-seen photos of Saturn prototypes from the company's archives have made their way onto the Internet. Recently this photo of a pre-production Saturn sedan, which was taken in 1988 inside GM's Milford Proving Grounds in Michigan, was uploaded to the site. Here's another one of it undergoing testing at the proving grounds. The fascinating contrast between a luxurious, classy look and solid, muscular details also abounds in the interior of the Opel Antara GTC. Warm tones and the generous use of leather are caught up in a charming interplay with technical materials like carbon fiber (seat back), stainless steel and aluminum (cockpit).